Often the nature of a collaboration is framed within a single episode limited in time, but this is not the case here. 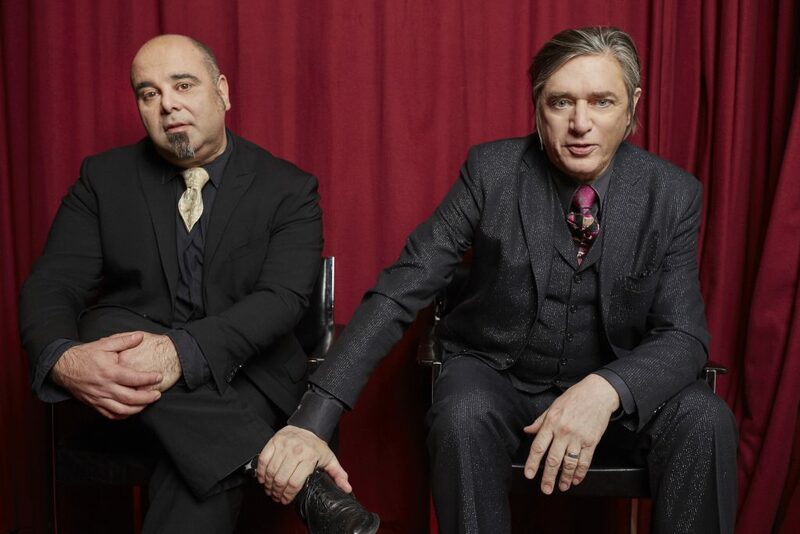 This is the result of a special bond, both artistic and personal, where Teho and Blixa reinvent their relationship to explore new territories. Nerissimo is the title of the new album. Its cover artwork was inspired by a painting from Hans Holbein the Younger titled The Ambassadors (1533). Embedded in the painting are enigmatic references to philosophy, religion, mortality, and illusion, which connect to some of the themes in the album. “Nerissimo” is the italian superlative for black (“the blackest”) and there is something very black about the music on this record. That doesn’t mean, however, that is is “dark” as the adjective is commonly applied to music: as the colour black contains all colors, the music contains a multitude of possiblities. Written and sung in German, English and Italian, the songs stretch from microscopic dramas played out in a Petri dish (“Ulgæ”) to the surreal epic and cosmic seven minute journey “Animelle”. The title song “Nerissimo” opens the album in its English version and closes it with the Italian version, bracketing the album like book-ends. New to this collaboration is the use of woodwinds, especially the bass clarinet which plays a deep and very significant role in several of the new songs, amid an arsenal of bells, Teho’s baritone guitar and the arrangement of classical string instruments. Together their sound forms a pear-shaped frequency spectrum to warmly envelope and support Blixa’s low mellifluous voice. Listening to the album, one undergoes a temporal passage between languages which intimately connects Rome and Berlin, the two cities where the album has been recorded, an emotional journey through the last three years of work together. Travelling in the multi-faceted blackness, the songs shape a diary of apparitions, of colours that could transform the whole universe once you name them, a nighttime flight with the lights off above European capitals. Teho Teardo lives in Rome and is a musician, composer and sound designer. He created the soundtracks for several movies from Oscar winner directors Paolo Sorrentino and Gabriele Salvatores. Blixa Bargeld was born 1959 in West-Berlin. As an autodidact he is working as a singer, writer, composer and director. He was the guitarist in “Nick Cave and the Bad Seeds” for more than 10 years and is the head and founder of “Einstürzende Neubauten” since 1980.